"With big names like Buster Posey, Andrew McCutchen and Evan Longoria in the Giants batting order facing a pitching staff bereft of confidence San Francisco look like a good value pick." The Detroit Tigers have had very little to shout about this season, they're 18.5 games behind the division leading Cleveland Indians and with a record of 50-70 they will be hard pressed to finish the season at .500. One of the few bright spots this season has been their dominance over the Chicago White Sox. The AL Central rivals have played each other 11 times this season and the Tigers lead the season series 9-2, as both the pitching staff and batting lineup have found consistent success. Jordan Zimmermann and Carlos Rodon face off in a mid-rotation matchup tonight, with Zimmermann chasing his sixth win of season against a lineup that only offers Jose Abreu as a real threat. Look for the Tigers to bounce back from last night's loss and extend their season series lead. Ronald Acuna Jr is fast becoming the most talked about man in the majors; the 20-year-old rookie has hit a leadoff home run in three straight games, a home run in five consecutive appearances and seven in his last eight. Acuna, and the Atlanta Braves, have dominated their series against the Miami Marlins as they attempt to strengthen their position at the top of the NL East. The Marlins have been outscored 25-8 in the series as Acuna and his teammates have found it easy to deal with all members of the Marlins rotation, all of this is bad news for tonight's starter Jose Urena. The Dominican starter has struggled this season, posting a 3-12 record, and his two starts in August have only served to further damage his stat line. An ERA of 8.71 in his last two appearances doesn't bode well when you're facing arguably the hottest hitter in baseball, Acuna and his teammates shouldn't have any trouble picking up the win and improving their playoff chances. The current series between the San Francisco Giants and the Los Angeles Dodgers has been punctuated by late innings collapses by the LA bullpen. Following the worrying news that all-star closer Kenley Jansen will miss at least the next four weeks with a heart condition the Dodgers have twice blown ninth inning leads against their Californian rivals. The news of Jansen's layoff comes at a time when the Dodgers are struggling to find any consistent pitching from their bullpen and with tonight's starter, Hyun-Jin Ryu, making his first appearance since he was placed on the disabled list in early May it is highly likely that Dave Roberts will be relying on his replacement pitchers to come in and provide support. 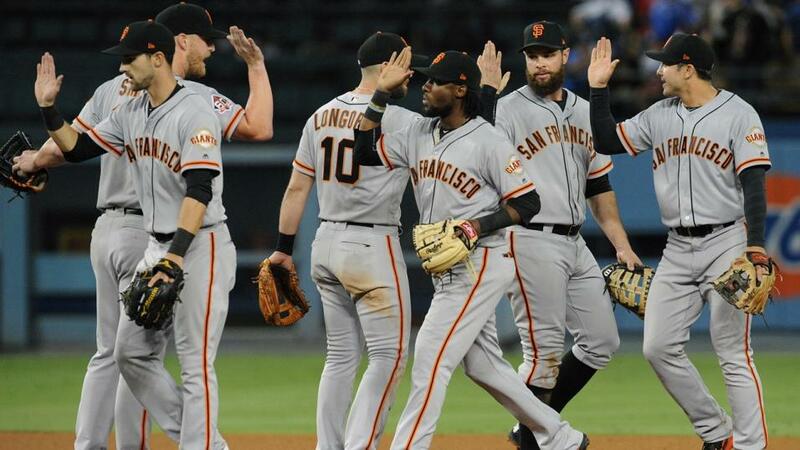 With big names like Buster Posey, Andrew McCutchen and Evan Longoria in the Giants batting order facing a pitching staff bereft of confidence San Francisco look like a good value pick.